This post is a little outside of what I normally write about, but I’m pretty frustrated and I think this needs to be said. I know, I know…they have their nice little “community standards.” They pay lip service to wanting to keep their platform safe for everyone. But they absolutely don’t mean it. Since they earn literally billions of dollars off all of us using their platform, people should know what they’re really like. The Ohio AAP was actively promoting this bill, and going as far as to block/delete people from their page who asked any questions or posted statements disagreeing with them. I got blocked for asking them why they were doing so. In response to this extremely unprofessional behavior, I posted on my personal profile, encouraging people to contact the Ohio AAP’s CEO, the one who was doing all of this. I wanted them to let her know why they opposed the law and disagreed with her professional behavior — respectfully. My profile is watched quite closely by trolls, who are extremely narcissistic and overly sensitive, so they reported the post until it got pulled — and I got a 24-hour ban. That’s right. Just for daring to stand up for our political rights, and asking people to speak out. That was in May. And then, at the end of August, there was a second incident. Someone sent me screenshots of a troll’s blog post, using my name and blatantly calling me out as someone who “hurt” him/her (by calling out trolling behavior as wrong…). This person’s blog says, right in the description, that it exists to infiltrate natural-minded groups and call CPS on families who don’t vaccinate, and try to get “anti-vax” nurses fired from their jobs. If you didn’t know, that’s a thing. People create groups, blogs, and tons of fake social media accounts. They use these fake accounts to sneak into natural-minded groups, take screenshots, and use them to make trouble. They will share these screenshots in their private groups to mock people. Then, if they really hate the situation, they’ll go to the person’s profile to find family members (spouses, parents, siblings) and will send the screenshots to them and ask them to intervene. They will also use these screenshots to call CPS or the police on families. We have had people in various groups I’m in visited by both because of anonymous internet tips (and nothing has ever actually come of it, because none of these people were really doing anything wrong). They also send the screenshots to peoples’ bosses to try to get them fired from their jobs. Basically, they exist to bully and hurt other people just for making unpopular/natural-minded decisions. So, naturally, we don’t like them much. And when they “attack” people, we will call them out to help others understand what is happening, so they can stay safe. Apparently, this hurts their feelings. We’re big, bad bullies for saying that, you know, trying to get people fired or have their kids taken away over a difference of opinion on parenting is wrong. They had to write a long tirade about how bad we make them feel for saying their behavior is wrong. That’s incredibly narcissistic of them. I mean, I don’t care if they vaccinate, or run to the doctor constantly. I do care when they attack me because I don’t. But they can literally make memes of my face and slander me all day long, but when I say that’s wrong, they start crying about me being a meanie. I wrote a little post on Facebook about how disgusting this behavior is. How they need psychological help if they think it is okay to behave like this and then play the victim. They descended upon my profile, reported the heck out of that post, and got me a 3-day ban. That’s right. The people who are actually bullying get to stay (I have reported their posts and pages and fake profiles, including the ones that use my name and image illegally, and have been told they “don’t violate our community standards” many times). But I get banned for calling out their bullying. Facebook has made it clear: they side with bullies. Facebook doesn’t have a way to contact them, because they don’t care what anyone thinks. They have more than a billion users, so if a few cease to use the platform, it’s no skin off their nose. So, it’s pretty clearly about money for them. In case anyone was wondering. Facebook is very powerful. They made over $40 billion in revenue in 2017, with over 2.25 billion users. So effecting any change is going to be difficult. Their “Community Standards” are an absolute joke. Facebook pretends to care about bullying and want good things on their platform, but in reality, they have a bunch of algorithms in place that simply delete posts and hand out bans if enough people report it. It’s basically if the community just doesn’t like something, it doesn’t get to stay — it doesn’t actually matter if it is or isn’t “okay.” No human reviews it. This is a good lesson: we cannot control this platform. When we use someone else’s platform, and that someone does not have our individuals rights in mind, and does not care enough to deal with bullying appropriately, we have absolutely no control over what happens. Facebook does not care about you. It does not care if you’re safe while you use it, or if you get harassed until you want to commit suicide (which sadly, has happened). It’s not realistic to ask everyone to abandon Facebook. It’s become too interwoven into our lives. Someone needs to come up with a large scale, viable alternative to Facebook (where the owners actually have meaningful standards and care about their users). For now, please stop putting all your eggs in Facebook’s basket. Use other platforms to connect with you friends, as well as your favorite businesses. Sign up for email lists (mine is below), use Instagram or Snapchat, or just send an old-fashioned text or email! (Odd that those are “old fashioned” huh?) Or…get off the computer and go live life in person! And please consider sharing this post…anywhere and everywhere, so that others may see what is going on here. If you are using social media, and you make “unpopular” decisions, then please protect yourself. None of these things should ever be visible to anyone who isn’t friends with you. Don’t add people to your friends list that you don’t know. Vet people if you’re connecting with them online by talking to them first, or checking to see if you have mutual friends. And watch out for fake profiles…which can have lots of mutual friends if they’re good fakes. If you have a question that could be considered controversial — such as asking about a very sick or injured child and how to treat at home — either don’t post, or ask someone to do so on your behalf. These are the types of posts that trolls look for and trying to make trouble on. It feels like we shouldn’t have to be so careful, but there are a lot of losers in the world. Please do watch out. 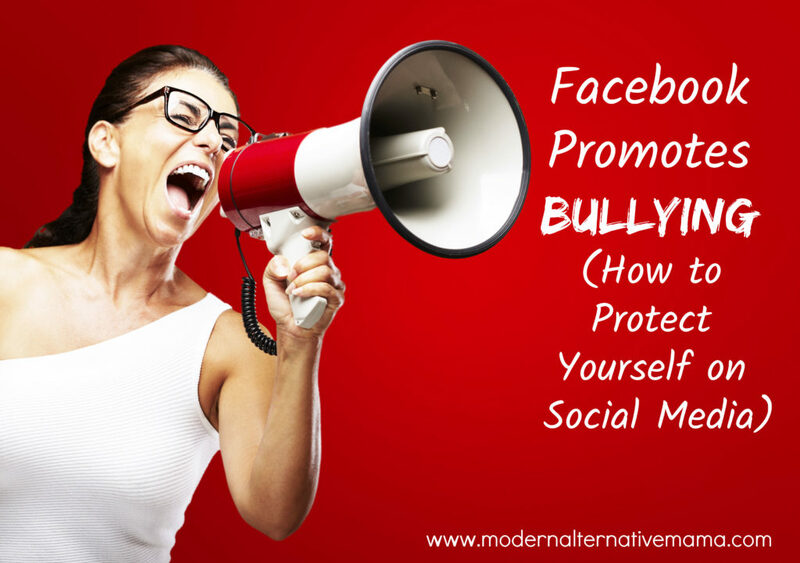 Do you feel like Facebook promotes bullying?